❧ Perfume & coffee mix. I'm not much of a perfume gal but there are a couple that I use on a regular basis, Curious by Britney Spears and Fancy Love by Jessica Simpson. Both have great scents and I've received many compliments about them while wearing them. Curious is a bit of a stronger smell, a little musky but not enough to keep you away. It's not too girly and sometimes I prefer that. 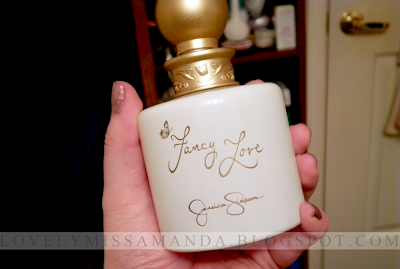 Fancy Love is liquid perfection, I kid you not. I've sampled Jessica's other two perfumes and I've got to say that this is, by far, my favourite of the trio. It has this creamy floral scent that just draws you in and it's definitely something you can wear everyday although I don't since I want it to last. As you know or should know by now, I'm a Jessica fan and I'll try to buy anything she puts out there, so I thought I would give this a try. I looked up a ton of reviews on YouTube before I actually bought it and almost every one of them was positive because it is just that good. 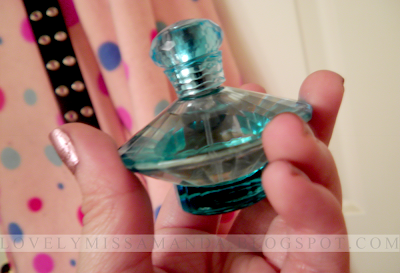 If you've never smelled it, I suggest heading to Macy's or finding a sample, you'll love it. 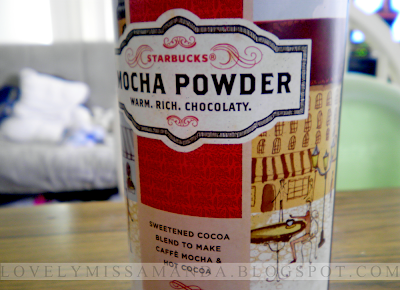 So, one of my mom's friends sent this to her because my mom is a big mocha drinker in the morning and her friend thought she would like it. Not a fan myself but the canister looked nice. I've never really cared much for dark chocolate and that's what this was, so it wasn't the greatest.